A story often lost in our discussions about the ongoing crisis in Syria is the unimaginable toll for civilians caught in the crossfire. 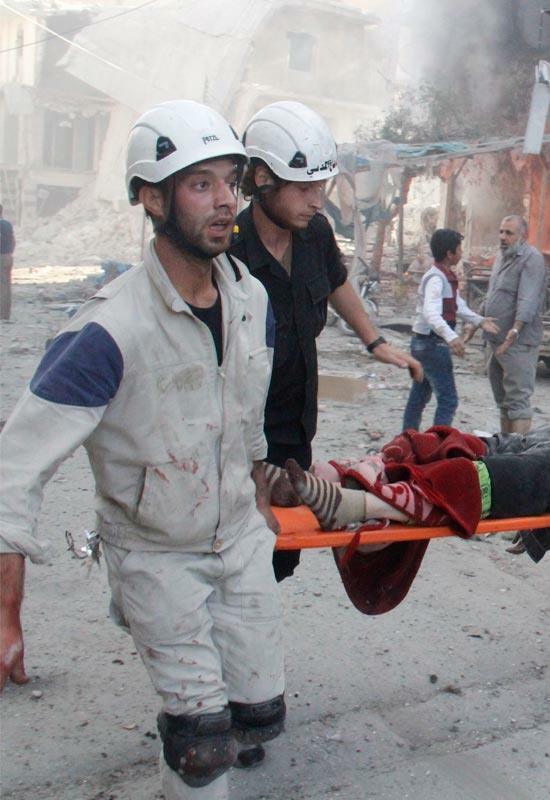 When bombs strike, the White Helmets – Syrian volunteers from all walks of life – carry out search and rescue missions, providing crucial first aid and searching for survivors amid the rubble. 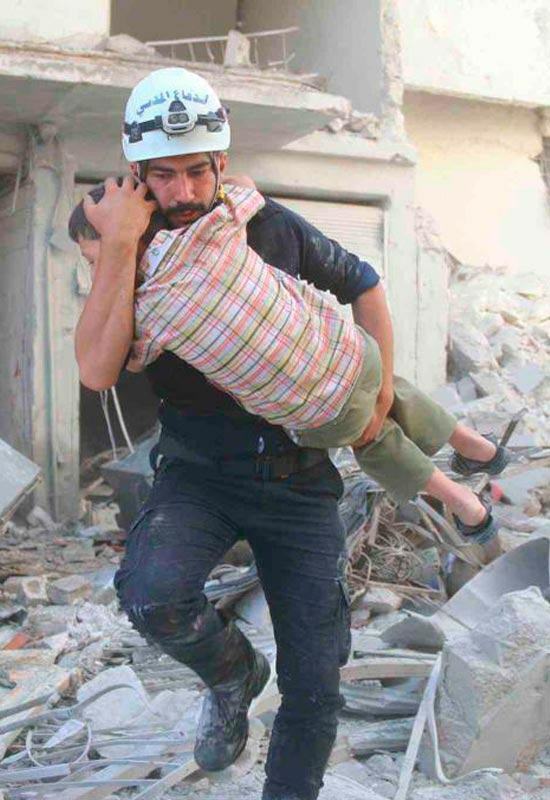 There are over 600 civil defense officers serving in Aleppo and Idlib, and they estimated that they have saved over 2,000 lives. The White Helmets are supported by ARK, a research, conflict transformation and stabilization consultancy that supports local communities in conflict areas. We interviewed Sarah, a staff member with ARK, to learn firsthand about the challenges these first responders face. After the interview is an excerpt from an article on the White Helmets. They are the volunteer civil defense (civilian protection) teams that began to form in early 2013 in response to increased attacks by the Assad regime against residential areas in liberated territories. Prior to their formation, there was no form of emergency response available to help those who had been trapped or injured by bombings or artillery attacks. As the regime withdrew from rebel held areas, all forms of governance, including fire fighters, police, etc. also collapsed and communities were left to help themselves as best they could. As a result of ARK’s governance capacity building programming, it received letters from a number of local councils asking for support to help them respond to bombings. ARK identified AKUT, Turkey’s search and rescue NGO, as a training partner, and in March 2013 began training teams in basic search and rescue. Since then, ARK and AKUT have trained hundreds of beneficiaries in basic and advanced search and rescue techniques, fire fighting and trauma response. These trainees have formed organized teams, working in shifts, and providing community services (such as repairing destroyed roads after heavy fighting) as well as search and rescue. What is life like for civilians in Syria? It is hard to generalize, as conditions vary greatly between liberated and regime areas and again within those areas, but generally, it is grim. In liberated areas, schooling has been severely disrupted and many schools have been destroyed in attacks. Power and water supplies are limited and in some places non-existent. There are huge internal population displacements – the populations of towns in some areas has more than doubled, with the ensuing resource strain that brings. The civil defense teams are made up of men who used to be bakers, students, engineers, bus drivers, decorators, salesmen, etc. – these very ordinary people now spend their days at bomb sites, saving who they can, but mainly recovering the dead. What needs to happen to bring peace to Syria? The answer from the teams would typically be removing the Assad regime as a first step (ahead of ISIS, who many see as a regime creation and believe could be relatively easily defeated, were moderate rebels not under attack from both side). How can ordinary Americans help? At the micro scale, donating to organizations like Hand in Hand for Syria who are keeping emergency medical centers going across northern Syria, despite deliberate targeting by the regime, will make a difference to people’s lives in the short term. There are also programs to sponsor Syrian students to finish their education in the US. The following is an excerpt from “Whoever Saves A Life,” an article by Matthieu Aikins, which appeared on the blog-publishing platform Medium. As the evening light began to lengthen shadows, the team heard a dull roar in the distance. The regime’s helicopters were back. The group was highly attuned to the noises of the city, like hunter-gatherers listening to the animal sounds of a forest. At night, Ahmed would describe them from his bunk. “That’s an artillery shell. That’s a jet. It’s going to fire its Dushka,” he’d say, and then would come the crash of the MiG hitting the front line with its cannon, like someone pulsing a blender. Sometimes a helicopter would be flying directly above them and they’d remain unmoved, noting that the thump of its rotor meant it was traveling somewhere, its blades digging in like an oarsman’s. A helicopter getting ready to bomb you hovered, the noise it made more akin to the deep growl of a jet engine. This one was way high up, a pale speck, and as they stood out in the parking lot watching it, a dot detached from it and tumbled slowly to earth, its impact announced by a mid-distance boom. It was a Russian-made Hind transport helicopter dropping a barrel bomb, the improvised but lethal explosives the regime had come to favor. Made out of empty fuel barrels or propane tanks, barrel bombs combine crude fuses with as much as two thousand pounds of TNT, along with pieces of junk steel and rebar that turn into red-hot shrapnel on detonation. They are as big as most conventional bombs, and a single hit is often enough to collapse the shoddily built concrete apartment complexes that comprise much of the city. The Syrian forces couldn’t really aim them, but that didn’t matter. The objective of the barrel-bomb campaign was to terrorize the population and render the city uninhabitable. The team waited for the second bomb to fall away — the helos usually carried two — and then jumped in the truck and rattled out toward the bomb site. Their wheel man, Abu Sabet, a mournful-faced older taxi driver, had worked big rigs before the war. He had an artful command of the little truck, whipping it nimbly through the rubble-filled streets. The bomb had fallen in a sparsely built neighborhood; several local men standing nearby said that no one had been hit. Khaled decided to get down and make sure; toddling over strewn cinderblocks, the team moved forward among the shattered little houses. The air was still thick with pulverized concrete dust, golden in the dusk. “Al defa al madani, hada houn?” they yelled, into the rubble. “Civil Defense, anyone there?” There was no answer. “Guys, let’s go,” said Khaled, waving with his radio. The helicopter might come back. A call came over their crackly, shoddy radio: Civilians had been hit. Khaled delegated his protégé Annas to take the rescue truck, and he and several of the guys jumped in and raced toward the smoke, the siren wailing. The bomb site was on a main thoroughfare in Sakhour, near a park and an intersection that had been sliced in half by a high earthen barrier to protect against snipers. “Stop stop stop stop stop,” shouted Annas when they’d reached a safe distance; the team jumped down and started running toward the site. The helicopter had dropped two big barrel bombs: one cratering the road, and a second falling on the edge of the park, which set a large palm on fire. There were a number of cars scattered around, some of them now twisted hulks. A crowd of rebels and civilians, as well as several ambulances, had already gathered. Ali ran toward a barely recognizable object on the sidewalk. It was a portly man who had been stripped of his clothes and powdered the color of concrete dust. He had been severed in half at the navel; his intestines were scattered behind him and one of his legs was folded up over his shoulder. He lay face down, and his eyes were closed, but as Ali ran up, his chest rose and fell a single time. Then he was still. Ali pulled on a pair of white latex gloves. There was nothing to be done for him. Taking a blanket, he gathered up the pieces as best he could, and then bundled him into the back of an ambulance, where bodies were accumulating. A rebel shouted from the road: “There are children in that car.” Annas ran over to a little blue sedan that lay crumpled near the site of the second bomb; it looked as if it too had fallen from the sky. He started prying frantically with a crowbar at the rear door; a mother and her children were still in the back seat. The mother had been decapitated by the blast, and the children were pale and immobile. As he hefted their small bodies out, he saw why. The little boy was missing his right leg below the knee, and had bled to death. His sister had taken a fatal piece of shrapnel through her chest. The site was close to several hospitals, and the wounded — including the driver of the sedan, the children’s father — had already been carted away. The team realized they were just recovering bodies from the wrecks. But they worked urgently; the site was wide open and exposed and the helicopter might return at any minute. It was hot and there was a sharp stench in the air, more acrid than blood. Someone yelled that a plane was coming, and the crowd broke and ran in a panicked herd. But it was a false alarm. When the last body was out, the team climbed back into the truck and headed toward the old station; the whole affair had taken 15 minutes.